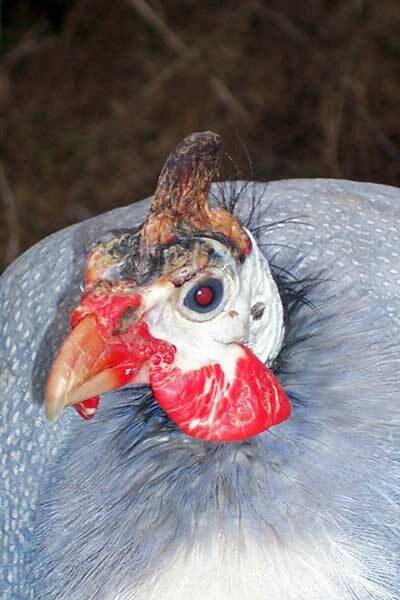 I have quite a few males in my flock of 23 guinea fowl and Charlie the guinea fowl has always been head of the pack. Funnily enough I was watching the 23 strong flock of guineas wander about the farm the other day and I actually said to my husband that it’s nice to see Charlie, who along with Diana and Camilla are my oldest guineas, is still head of the pack. Well that was until yesterday, when I observed some different behaviour from Charlie and the other males. There is generally male rivallry in the Spring when the males and female start pairing off for the breeding season. Anyway yesterday when I went to round them up, they were all in the paddock and when I counted them there were only 22. I could hear a guinea calling from somewhere else and upon closer inspection I could see Charlie in the lane, which I thought was unusual as he is head of the flock and always leading all the others about. Well Charlie rejoined the group only to be chased by one of the other guineas. When I managed to get them all in the hut, including Charlie, who followed later, abit of chasing began again around the hut, which is thankfully big enough for none of the poultry to get hurt. I went off to get fill the drinkers up and when I came back and entered the hut, Charlie flew at me, well at the door as if he wanted to fly out and he managed to land on top of the inner door frame. He eventually cam down and started to cower in the corner, so I am assuming that one of the other male guinea fowl is asserting his authority. I noticed that Charlie kept his distance from the flock again today and he didn’t really want to go int he hut tonight. Maybe one of the other guinea fowl can see that Charlie is getting older. I got charlie, Diana and Camilla about 5 years ago and they were already adults so they must be at least 6 years old. I will keep my eye on the situation. I have already placed in the hut a tunnel for the guinea fowl to hide under if they need to get out of the way, so hopefully Charlie will be able to get out of the way. It is very interesting observing the behaviour of the guinea fowl throughout the different seasons. Let me know if you keep guinea fowl and have observed the male guinea fowl pecking order being faught over. Glad you like the photo. hope all your guinea fowl are ok. These very noisy birds look like a bunch of AWOL army helmets as they run across the yard. They are said to be good for controlling the Lyme Disease-bearing deer tick. I don’t know any research on this, but lots of folk believe it and I sure hope it’s true.